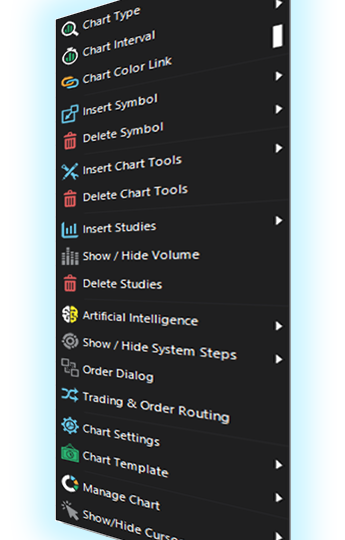 You can chose from eleven (11) built-in chart types: line, candlestick, bars, point and figure, renko, kagi, three line break, equivolume, equivolume shadow, candle volume, heikin ashi. You can plot time frames from tick / second / minute all the way up to daily, weekly and monthly. You can also plot time frames built out of any custom number of ticks, seconds, minutes, hours, days and weeks. Composites can be any combination of any number of individual instruments, sourced from local data files or streaming data sources. You have a large choice of chart tools and annotations in the S-Trader’s charting engine. The S-Trader charting engine has a wide selection of built-in technical studies. Additionally, you can easily define any custom study you want using the platform's available Quant Script engine. You can define expert advisers to show occurrences on charts. You can apply one-to-many advisers on one-to-many symbols on every chart. Expert advisers previously defined can be used to build consensus reports in any time frame to determine the frequency of occurrence of certain events over any period of time. You can save preferred chart settings, including built-in and custom studies and their formats, as chart templates that can be subsequently applied very easily to other charts.